There have been a lot of books and articles discussing the scientific revolution that took place in the 17th century. However, even after 9 years reading and research, I’m still uncertain about the precise place of alchemy in the scientific revolution, meaning what part alchemical ideas, knowledge, experience and technology played in it. The problem for my understanding being that the book is focused on Starkey’s work and ideas of other alchemists near in time to him, and that it is written in an academic style with a great deal of supporting detail. Moreover, the main link to medieval alchemy being the works of pseudo-Geber, (which Newman identifies as being Paul of Taranto) and specifically the interest in testing and use of the balance, which he traces back to Arabic sources, but, there is a much wider world of alchemy out there which Newman doesn’t bring in as relevant, whereas I think a lot of it is. Whilst it is good practise to be specific and narrow about exactly what you are are saying and the evidence you use to support it, Newman has this tendency concentrate only on the specific few sources that he knows in detail, and appear amazingly confident about his sometimes broad statements, which just rubs me up the wrong way even if he is correct. Alright, so it is about the 17th century work of Glauber called Furni novi philosophici. You can get an immediate idea from the equipment listed how the early modern chymists/ post-alchemists were indebted to alchemists and alchemy in general for their equipment, as well as the non-alchemical artisans of the period who had taken alchemical works and practises and used them solely to manipulate matter in order to make real objects of value, not the philosopher’s stone. The concerns given too, about making cheap or expensive furnaces, of having the correct alembics for the job, i.e. 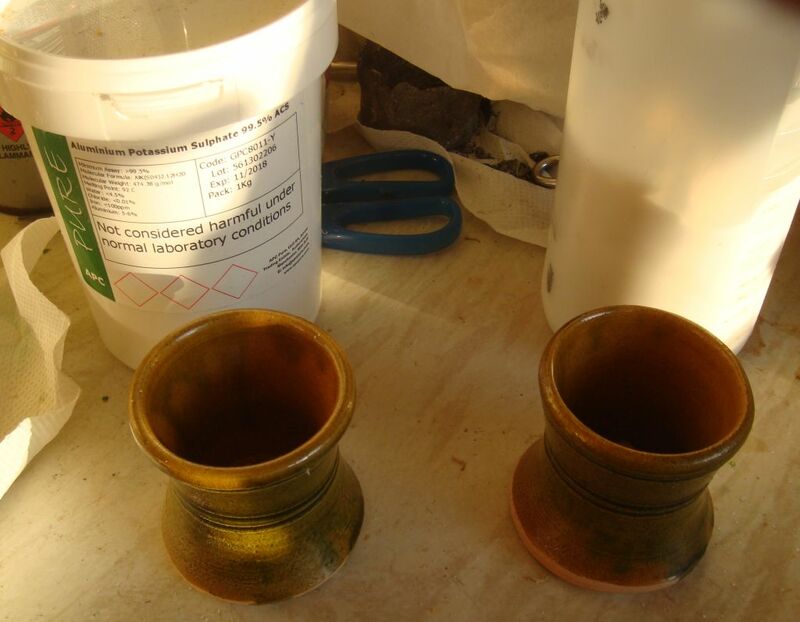 iron ones for most substances but pottery ones for sulphurous corrosives, is seen in many alchemical works too. Thus I continue to assert that many alchemical works are practical and have definite physical aims in mind. Of course many others were mindlessly copied by obsessives and charlatans, but still there is a definite basis to it all. Which practise described matches the unfortunately rather pointless activities of modern alchemists, with their various salts and oils etc distilled and crystallised from plants. So, it seemed sensible to try dipping the brass into alum or potassium nitric solutions instead of sulphuric and nitric acids, as suggested by JDP, in a recipe taken from Della Porta’s “Natural Magic”. The setup was the same as before, a strip of modern brass sheet, probably a bit high in Zinc compared to historical brass, heated by a blowtorch and quenched into solutions. 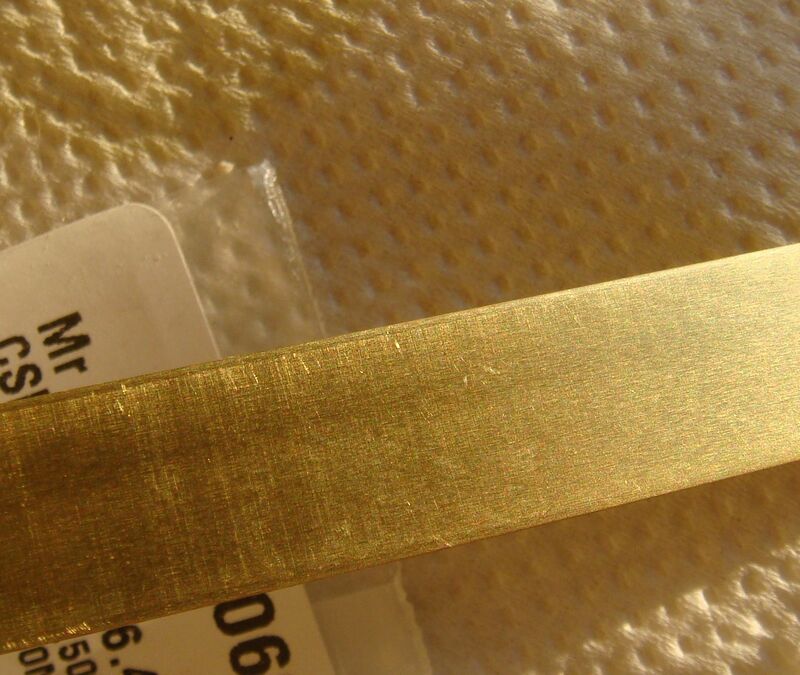 Admire the shininess of the brass, with the small scratches probably imparted during the rolling process to turn bar into sheet. After I dipped it into alum and potassium nitric solutions, I did find it somewhat whitened. The problem was I did this a couple of weeks ago when I was suffering from bad sinuses and disturbed sleep, so I forgot to write down which solution produced this result, because I was actually going to write it up then not now, but anyway. So this time round it does work a bit better, exactly how I have no idea, I’ll have to go and think about it. There are quite a few more recipes in della Porta, although some are a bit toxic. I am also working on the bigger alchemy book, which means I might be doing experiments, just not ones I want to put up online, or else what’s the point of the book? Asking you all to contribute to my expenses isn’t going to make me rich, the only way to go is mass media exposure or actually turning lead into gold, which I know isn’t possible, leaving me with the book and whatever else I can get from it. 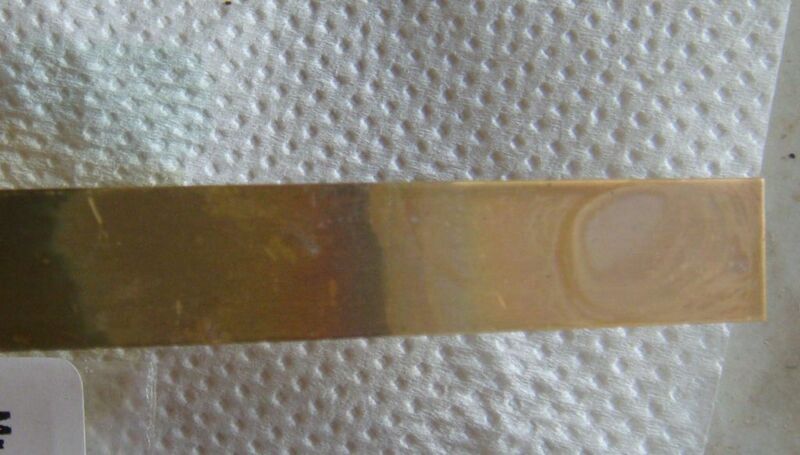 After I dipped each end into alum and potassium nitric solutions, I did find it somewhat whitened. The problem was I did this a couple of weeks ago when I was suffering from bad sinuses and disturbed sleep, so I forgot to write down which solution produced this result, because I was actually going to write it up then not now, but anyway. Who was an English, Elizabethan alchemist. I have recently gotten a copy of Peter Grund’s edition of the text, based on Simon Forman’s 1590 copy of it. The original was finished about 1572, but it seems various copies and editions were in circulation, with 7 complete manuscripts surviving. Locke himself was a carpenter, craftsman and thus was at the centre of the kind of engineering works of the time, having preiovus worked as the surveyor and chief carpenter for the contrsuciton of Upnor castle. It is basically an attempt to curry favour with William Cecil, secretary to Queen Elizabeth, because Locke wanted to return to England from Russia, where he wasn’t having a good time. Oddly enough there seems little evidence that he had any knowledge of alchemy before he left England, instead picking it up in Russia – I’m sure there’s some interesting research to be done there if enough evidence survives. It is the only work that Locke ever wrote on the topic. And we know that Cecil had been interested in alchemy, and still was at times, but I suspect he was put off a bit by the affair of De Lannoy, who failed to produce any gold despite promising to do so. To add to the confusion, it is not clear that Cecil ever actually received the book, instead Locke appears to have escaped Russia before he managed to send a copy of it, but we have no information about Lockes subsequent life. The chapter titled “Sociohistorical Context” has a great deal more information. Locke’s book is pretty much entirely derivative, with specific chapters of it copied directly from older alchemical works, some of which are famous like Ripley’s Medulla alchemiae. Others of them are less well known, such as ‘Scoller and Master’, which was popular in England but not so much elsewhere. 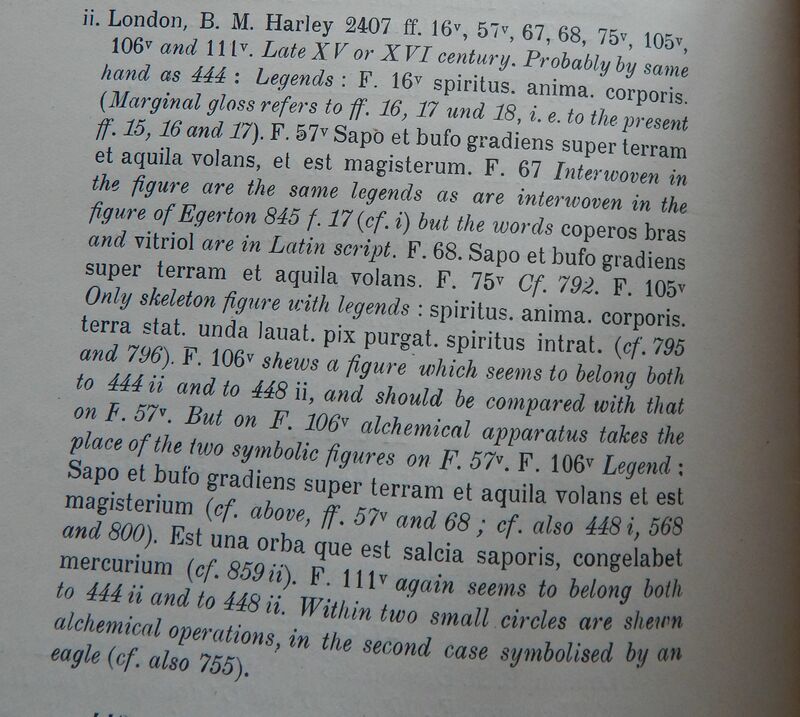 One of the reasons Grund chose to use the Forman edition was because it’s date is known (1590) and it has a good provenance. All too many copies of texts have fake provenances and were poorly copied in the first place, so it makes sense to use one which is known and a good copy. 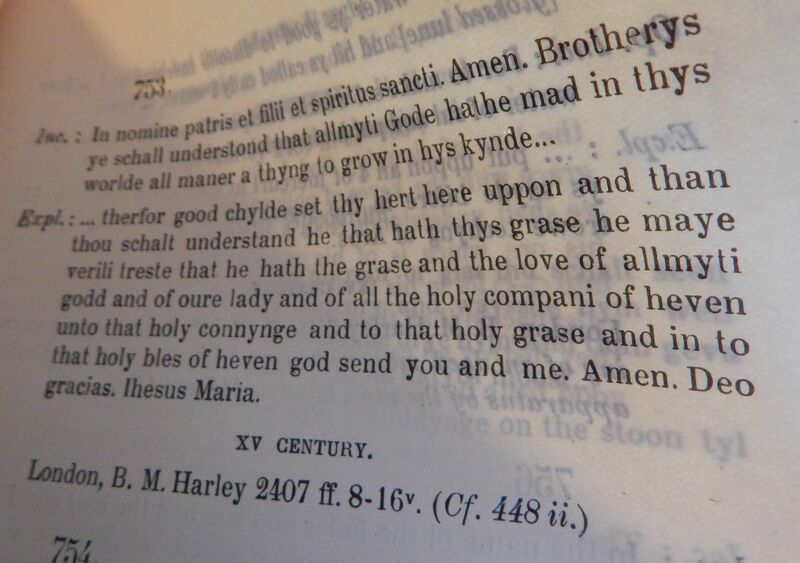 2 – Scoller and Master (anonymous), Perfectum Magisterium (pseudo-Arnald of Villanova); and an unidentified text. There are animal, mineral and vegetable stones, mercury sublimed with salt and vitriol; gold and silver are treated with mercury to calcine or remove stuff from them? The Green lion – page 207, his conception of it seems to involve silver, which with some mercuric substances produces a green liquid. So it is not used on gold, nor is it green to begin with, but only after metals have been added, which seems a bit different from older ideas of the green lion. Page 173, discussion of the several kinds of mercury, and the ones extracted from silver and gold. In this regard he appears to adhere to the two mercuries theory, dating back to the 14th century. He is against the use of corrosive waters drawn from vitriol, saltpetre and alum and the like. But interestingly, he uses the older idea of mercury sublimed with salt and vitriol to produce a white substance. He also seems to use the word silver and the symbol for the moon, or indeed gold and the sun, to mean different things, perhaps even different things at different places in the text. But of course different copies use the symbols in differing amounts; either way a full suite of alchemical sigils is used, covering the planets, sulphur, 4 elements, ounce, pound and take or recipe. The book also comes with a glossary and many pages of explanatory notes which are of great interest if you are carrying out extremely detailed research. Altogether it is a worthy work, it is a shame such rigour and depth of investigation has not been applied to many other works. 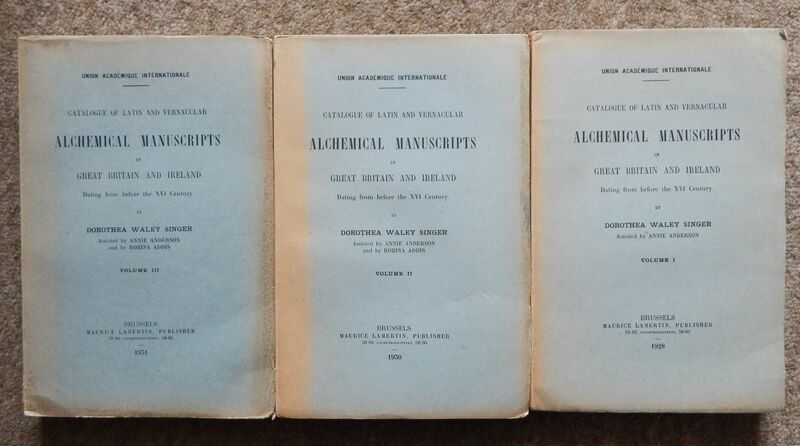 Anyone interested in 16th century English alchemy should have a copy.